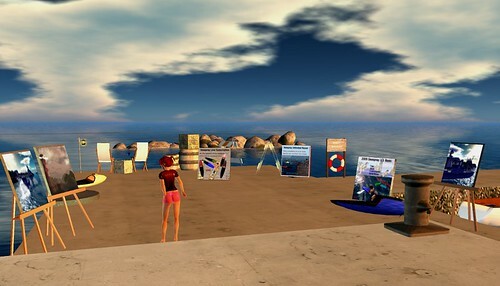 When I first came to Second Life, three years ago last Sunday, I was mostly intrigued by the idea that you could make things there, in this “virtual world” where the laws of physics would be perhaps kinder, and more mutable, than in the real world. Although we all know that the difficulty of The First Hour Experience is one of the Big Problems with the platform today, I wasn’t a victim of it: I was hooked after about ninety seconds. A whole, and apparently pretty large and complex and random, world to explore, without having to drive anywhere or get dressed or even get out of bed! And (see above) where anyone could just stick out a hand and build random things! Amazing! For awhile I and/or it was crashing so much (you kids don’t know how easy you’ve got it these days!) that I wasn’t sure I was going to be able to stand it, but it and I got used to each other, and I stuck around. It’s been a fascinating three years. As I say probably far too often, I came for the building and scripting and stuff, but stayed for the people. I still love the building and scripting, but I’m pretty sure that I spend less time on that than I do on talking to friends, dancing in clubs, meeting new people, and generally hanging out. There is for obscure reasons a tradition in some subcultures of Second Life, that involves leaping naked from the sky, holding an umbrella, on one’s rezday. 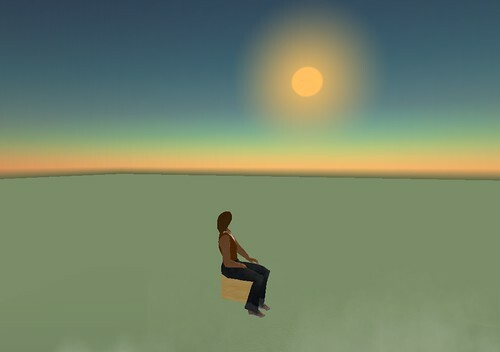 So there I am, again ‘way up in the virtual sky, on a slightly more sophisticated virtual sky platform (my floating rocks build, which is still up there over the Hughes Rise park), with my virtual umbrella, pondering the drop. It really is a significant drop, isn't it? Being Dale has, I’m about 100% certain, been a good thing for me. And continues to be. Different people have very different attitudes toward, relationships with, their virtual selves. For me it’s pretty simple: I am Dale Innis. Saying that I identify with my avatar is as much of an understatement (and an overstatement) as saying that I identify with my RL body. (Much more on that thought here.) My Second Life friends are friends of mine, just like my First Life friends are friends of mine. I don’t necessarily know where my SL friends live in RL, or what they do for a living, or whether they are married or have children; but since I can’t remember that sort of fact about my RL friends for more than five minutes either :) that’s not a very large consideration for me. The main difference, really, is that it’s so much easier to visit the SL ones. I continue to think, as I said all those years ago, that when we eventually look back on these very early days of virtual worlds, we will see it as the beginning of a huge and important change in the ways humans live their lives. Exactly what that change will be, I don’t pretend to know. I used fiction to speculate about it some back in Meaties; I like that story quite a bit (he said modestly), and it’s one possible answer to that question. It might even be something like the right one; time will tell. It's pretty chilly up here. Lots of people that I know in SL, and even more people that I know of, have been talking lately about the Good Old Days of Second Life, and how it’s going downhill, and the best parts are over, due to some combination of floods of newcomers and ‘bots, bad media reporting, stupid and/or malicious actions by Linden Lab, drama and trollishness, personal burnout, and whatever else. I do sympathize with the feelings, and I am often puzzled by how completely clueless Linden Lab seems to be about communicating at least with the more engaged and articulate and clued segments of their customer base. I continue to attribute it to organizational randomness rather than to any self-destructive attempt to drive customers away, or even a desire to replace unruly individual customers with large wealthy better-behaved corporate ones (I think the Lindens would like to have both, and are just not all that good at communicating with the former). And for myself, I’m still having a great time. :) I have my first real store-like things, I’ve been exploring lovely places and having adventures with friends, actually enjoying official organized events, and (of course, still, always) building random odd things (and things that build random odd things). 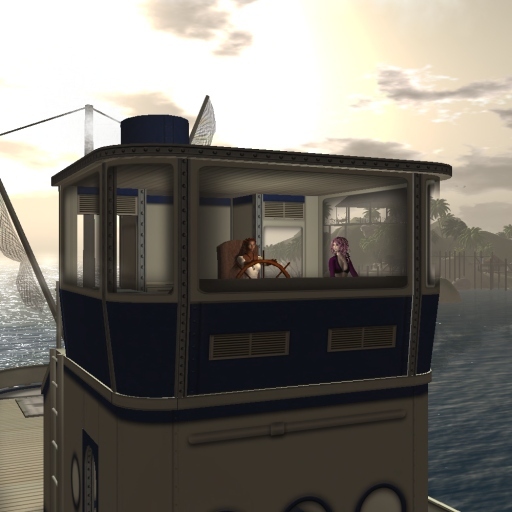 There have certainly been days and nights when I didn’t feel like going inworld; so I didn’t! But in general when the day is done and I have no more chores, and I can settle down into a comfy chair or bed with my laptop (yay, laptop!) on my lap, and fire up a viewer and find myself in my Park, or my Extropia pod, or wherever, and the IMs from friends, and the freebies from last night’s Midnight Mania boards, and the announcements of new Midnight Mania boards, and the scripting questions, and… all begin to flow in, and I open my inventory to decide what to wear and do some token inventory-sorting, it feels kind of like coming home. Not that I’m knocking First Life; that’s pretty wonderful also. And when talking about Deep Things I think it’s a mistake for me to think of them as two different things. I have a life, and part of it is spent in Second Life, and part of it is spent in other places. And it’s all good. And, in the Spirit of the Season here in the US and A, I’m thankful for all of it. In Second Life, I can be a boy, a girl, a panda, a child, a tiny elephant, or a bright shiny sphere. I can fly, I can walk under water, I can build a dirigible with my mind. I can meet people from countries I probably couldn’t find on the globe, and I can meet someone from down the street without knowing it. It has its share of people with issues, of griefers and trolls, of misunderstanding and even some cruelty, but well, that’s humanity for ya. I can build, create, explore, do art, try things out, experiment with my own shape and size and color and consciousness, and hang out and talk with other people who are doing the same kinds of things, and also very different ones. That makes my life richer. Not my First Life, or my Second Life; just my life. No more “Coming Soon” signs! I’ve had the first three products (the basic boat, a really cheaup nomod limited-time demo version, and a lifetime subscription to future upgrades) out for quite awhile, but the last product (the one at the top there in the picture) took a bit longer. It’s the most complicated, since what you actually buy is a device that lets you and anyone else who comes by your land rez temporary boats to use; so it’s a product within a product, and required lots of testing. Then, due to great good luck and great good friends, I got the opportunity to set up another store in a place with quite a bit more space, in Waterway West New York, which is one of a whole bunch of sims run by Southern Tier Health Link New York. My piece of pier is quite a bit bigger than the parking space at Busy Ben’s, so as well as the four Seaspray products, I’ve got a few of my photographs (appropriately water-themed) out for sale, and some places to sit an’ stuff, as well as a boat-rezzer so people can zoom around completely free. I should do a whole weblog posting just on the NY HealthScape sims, ’cause they are cool. While I’m getting around to that :), here’s a Chestnut’s Choices from back in August, that talks about the place a bit. And here’s the Snapzilla photos of Panacea Luminos, the head honcho. And here’s a Second Citizen thread about the opening of a marvelous art exhibition there. Come by! I mentioned last time that I won a spot in Busy Ben’s Vehicle Lot, in the Boats section. Monday was the first day we could move in, and I’ve moved in! Soon the Basic Version will be available, which will have lots of customization features (125 colors, nine textures, shine and glow and light), locked and unlocked modes, fast and slow modes (the current one is pretty fast, and not hard to lose control of while zooming), and like that. That one will be 50L. Busy Ben’s (I’m in slot 44). 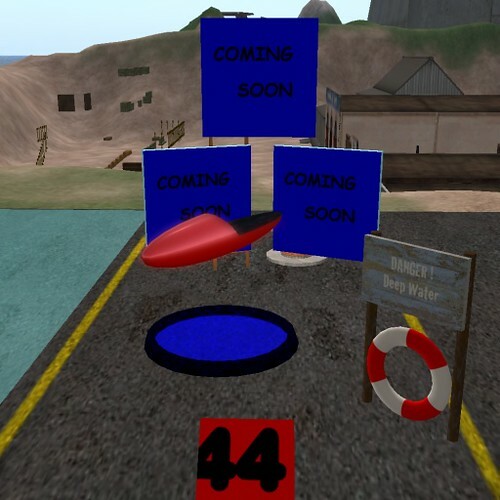 I have a vendor spot in the “Boats” area at Busy Ben’s Vehicle Lot, and I’ve been working on a boat to sell there, hanging out in the Blake Sea – Azimuth rezzing area as a workspace for no particular reason. And every once in awhile a big empty boat would pass by. I know I’ve been sort of skeptical about Linden-run builds in SL, and that includes, directly or indirectly, alot of the stuff in the Blake Sea.